Improve Your Athletic Performance? Take A Shortcut With These Expert Tips! Which track and field athlete does NOT want to improve his or her athletic performance? Anyone who is competition minded wants to be better. Always. Maybe you want to improve for the team, maybe to break a personal record, maybe just to stay fit and healthy. Whatever your goal, this web site is determined to help you. My name is Aston Moore. I am a coach in track and field specializing in horizontal and vertical jumping. I am widely recognized as one of the foremost experts in jump training in the world today. I have over 30 years experience firstly as an elite competitor - one who has represented Great Britain in the Olympics and other major world wide competitions. I am now the personal coach and mentor to some of the most successful athletes in the world. My stable of athletes and sports people includes not only medallists in truly major world events such as Olympics Games, but also World Champions and World record holders. If you want to be a faster, stronger and better athlete you will most likely not only listen to your coach (if you have one) but also read web sites about track and field and sports training. Thanks to the Internet we now have access to an incredible wealth of information. However, if you use the Net to find tips and advice, you will regularly find imprecise and contradictory information or advice from "trusted" resources that are not as "trusted" as they say they are. Here at Elite Athletic Performance I want to provide you with no nonsense, research based information on a variety of issues related to track and field, sports, health and fitness. In other words, you will find proven workable solutions for every sportsman and sportswoman, whatever your level. We all love to get into shape or meet our goals as quickly as possible but not everyone is able to hire a coach or trainer. I understand this. I will be pleased to be your personal trainer that speaks from your desk top and help you improve your athletic performance through this site. The Athletic Performance Blog is a special page featuring short messages about new additions and updates to this website. The singular sport known as track and field is one of the oldest sport in the world, it is not just one event the sport is many events. 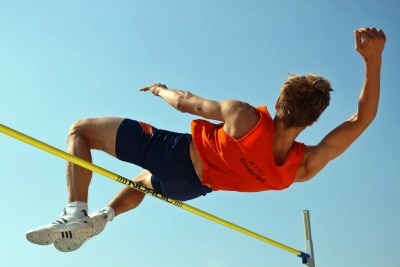 High jump is an event that needs agility, speed and power in addition to good technique. The jump consists of three parts: the approach, the takeoff and the flight. Some athletes and coaches view the long jump as simply an event that involves running and jumping. Athletes have to master a number of different lifting techniques into their training program. It is easy to make mistakes. Why is speed training so important for all athletes and sportspeople? If you want to add more energy to your exercise routine, what you need is plyometric training. Plyometrics are also called plyos, and they consist of powerful and fast movements. Strength training exercises are good for athletes. Ideally, it is a way to include physical activity in your every day routine. Circuit training was first developed as a method to improve general fitness. It is a great way to improve endurance, strength, and even mobility. Aston Moore has been coaching track and field athletes for many years and now shares his knowledge through this web site. You would like to know more about sports training, athletic performance or track and field? Looking for Track and Field News that makes the difference between good and excellent athletic performance?